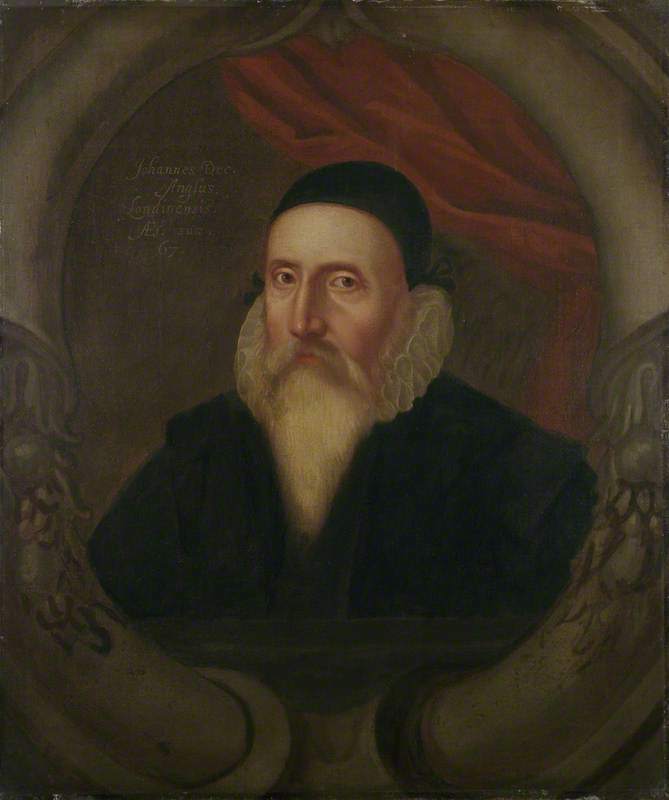 Though proud of his family’s genealogical roots in Wales (which he attempted to connect to those of the Tudors), John Dee was born a Londoner to a merchant family of fluctuating commercial success and baptized at the parish church of St Dunstan’s in the East on 13 July 1527. Like Gabriel Harvey, he received an excellent education for one of his social class—grammar school and then the University of Cambridge. In Dee’s case, the grammar school was that of Chelmsford in Essex, from where in 1542 he went up to St John’s College, Cambridge. By 1546, his intellectual achievements had won him election to a fellowship as under-reader in Greek at Trinity College, Cambridge. It was at Trinity that Dee pulled off a spectacular coup de théâtre by rigging stage machinery for a production of Aristophanes’ Pax in which one character appeared to ride up through the air to the roof of the College on the back of a scarab beetle—earning him an early reputation as a magician of sorts. It was also at this point that Dee began to travel to the continent to study and meet with an international cadre of leading scholars, including the distinguished mathematicians Gerardus Mercator and Gemma Frisius. On those travels, particularly during his studies at the University of Louvain in the Low Countries, and in France, Dee also bought books, forming the beginnings of an extraordinary, cosmopolitan library. His annotations in these books would also constitute a significant source for many of the known biographical details of his life. On his return to England, Dee set about establishing a career at court. As for so many of his generation, this task was troubled by the rapidly, sometimes violently, shifting politics of the reigns of Edward VI, Mary, and Elizabeth. He was greeted with initial success, receiving a substantial pension from the king and the patronage of the leading figure of the court, John Dudley, duke of Northumberland. But, whatever Dee’s prospects of advancement, they were rapidly dimmed by the accession of Mary I and the execution of Northumberland weeks later. Dee established himself in London not as a teacher of classical languages, but of mathematics, and engaged with merchants interested in harnessing his technical knowledge in the service of navigational ventures—an interest that Dee maintained throughout his life, as the contents of his library amply reflect. The reduction in his circumstances worsened following accusations of construing horoscopes of members of the royal household, tinged with suggestions of a conjuring conspiracy against Mary. Arrested and interrogated on the orders of the Privy Council, Dee was referred to the Bishop of London, Edmund Bonner, after questions were raised about the orthodoxy of his religious beliefs. Dee’s personal piety was unquestionably sincere, though the particular character of his Christianity was—to say the least—idiosyncratic and certainly heterodox when measured against the teachings of any church, whether Catholic or Protestant. 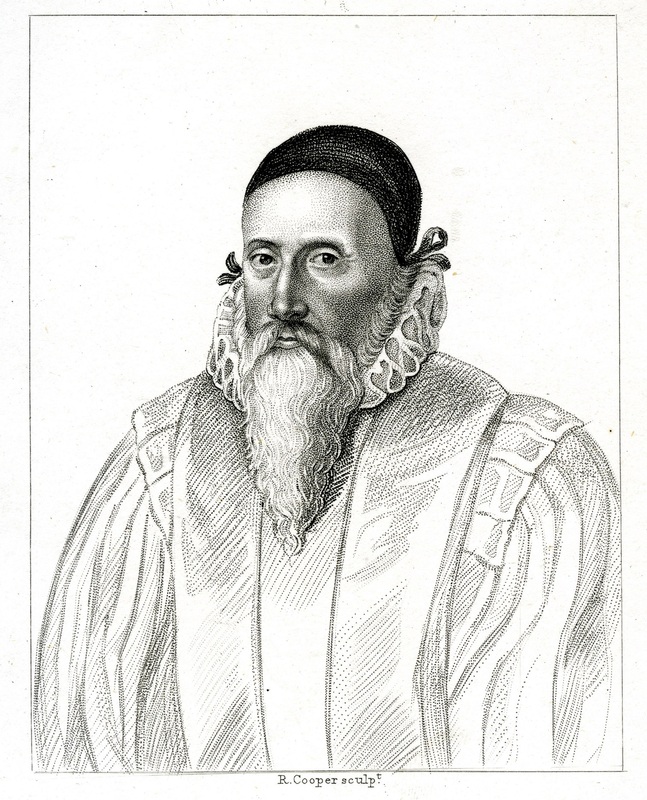 The year after his arrest he was serving as Bonner’s personal chaplain, and he later petitioned Mary, citing the dispersal and destruction of the monastic libraries, to found a royal library in which “such incredible store, as well of Writers Theological, as in all other liberal Sciences, might be saved and recovered.” (Roberts & Watson, 194) Throughout his life, Dee appears to have accommodated his faith with the beliefs of the powerful, whether that was the restored Catholicism of Mary, a Reformed Church of England under Edward and Elizabeth, or the Catholic establishment of France and the Holy Roman Empire. This may have been due more to a pietistic disregard for the precision of theology rather than a politique cynicism that might also have been entirely uncharacteristic of Dee, but it left him distrusted by influential figures on both sides of the confessional divide that convulsed sixteenth-century Europe. Far more solid was Dee’s commitment to the new heliocentric astronomy of Copernicus that placed the sun, rather than the earth, at the center of the heavens. 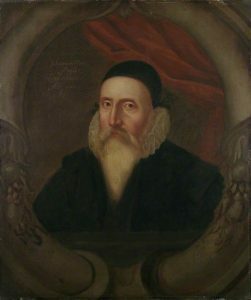 Dee’s extensive astrological calculations should be seen as akin to his astronomical studies, for he was a strong believer in putting both to practical use, whether in reckoning oceanic navigations, or influencing the policy of the Elizabethan state. Dee’s former service to the Dudley family was rewarded once more through the patronage of Robert Dudley, the queen’s favorite and later earl of Leicester, and included consultations over an auspicious date for Elizabeth’s London coronation. In a similar vein (though on this point Dee was certainly an outlier among his peers) his interest in otherworldly forces extended even to communicating with the angelic powers responsible for the movement of the heavenly bodies. Dee undertook further travels on the continent, again seeking out his peers, including Conrad Gessner at Zurich, as Dee travelled from the Low Countries, through the Swiss cantons to Italy before returning to England in 1564, weighed down with the books purchased on his travels. These were installed shortly thereafter in a permanent residence outside London, at Mortlake in Surrey, which nevertheless facilitated courtly visitors owing to its convenient location close to the royal palace at Richmond, and along the court’s route there from Westminster. Despite this considerable move west of the metropolis, Dee long identified closely with the city: the style of his autograph, “Joannes Dee Londinensis,” appearing on the title page of his copy of Geoffrey of Monmouth’s medieval Britanniae utriusque regum (Paris, 1517). At Mortlake Dee accumulated, maintained, and systematically read and annotated one of the finest libraries in Elizabethan England over a twenty-year period. Dee’s library, comprised both of manuscripts and printed texts, comprehended not only his mathematical and astronomical studies, but also his abiding interests in the allied subjects of alchemy, Hermeticism, and medicine. There he also cultivated his antiquarian fascination with the medieval history of Britain, from which sprang his idiosyncratic conception, both of his own family tree, and of a restored British Empire at once Arthurian and Utopian. Dee’s antiquarian knowledge placed him on the cutting edge of an emerging field of scholarship. Although he is not known to have directly collaborated with the leading London and Oxbridge antiquaries, his library contained many of their works and his marginal notes reference their collections of manuscript material. Married by the mid-1560s and long supported (in apparent non-residency) by at least two ecclesiastical livings in Worcestershire and Lincolnshire, Dee was nonetheless often applying for further preferments to underwrite his expensive alchemical and book collecting enterprises. By 1570 perhaps Dee’s most famous publication appeared, his “Mathematical Preface” to the Billingsley translation of Euclid, an encomium by the Elizabethan mathematician to the infinite, but practical applications of geometry to all manner of pragmatic arts, including his peculiarly worded disciplines of “Anthropographe” (measuring symmetries within the “perfect body of man”) and “Trochelike” (calculating all forms of circular motion), et cetera. Numerous other learned tracts would appear under Dee’s name throughout his long and illustrious career. Dee’s profound interest in magic and divination—including his own possession of a famous black obsidian mirror (in fact an exotic Aztec artefact later owned as a curiosity by the collector Horace Walpole) and crystal ball—caused him to employ several mediums, most notably Edward Kelley. It was with Kelley that he undertook yet another extensive itinerary to the continent, particularly through his association, beginning in 1583, with the Polish prince Albrecht Łaski, palatine of Sieradż in Poland, who was greatly inclined to Dee’s alchemical knowledge. The occasion of this journey proved both propitious and disastrous. In anticipation of this departure, Dee planned for some 800 books to be taken with him in train, and occasioned a fine catalogue of his library to be made. During his long absence, a substantial portion of the books he had left under the unfortunate stewardship of his brother-in-law, Nicholas Fromonds, were confiscated or carried off by his antagonists, some of whom tried to erase traces of his ownership while preserving his characteristic marginalia. Dee, Kelley, and their families would pass a year or so in Krakow (to which they would also return) before heeding the call of their angelic “motions,” which compelled them to the court of the “wizard’ Emperor Rudolph II, who was deeply interested in alchemy and the occult. Banished in 1585, they removed to southern Bohemia, where Dee and Kelley adopted a familial commonality that extended to their wives. By 1589 Dee had parted company with Kelley and was back in England, succeeding in the recovery of some, but by no means all, of his purloined books (many of the latter account for the large trove of Dee ex-libris volumes now in the library of the Royal College of Physicians). Dee’s later life in the 1590s, and up to his death in 1608, was marked by straitened financial circumstances, and little evidence of extensive book acquisitions on the ambitious scale of the 1560s to the mid-1580s. Nonetheless, by 1592 he boasted of a library of nearly 4,000 volumes at Mortlake, a quarter of those manuscripts. Dee appears to have spent many years away from Mortlake between 1595-1605, with periodic returns to London, due to an often embattled wardenship granted him over the collegiate church in Manchester—a modest fragment of the court patronage for which he had petitioned regularly during the economically depressed decade of the 1590s. Dee’s financial troubles appear to have precipitated the sale of certain books, though his energies for scrying and angelic motions had not ceased, and may have continued even until his death. The sniff of sulphur around Dee likely did not help endear him to the new king, James VI & I, whose views on magic and witchcraft are well known. Dee died in March 1609, his library scattered. It remains so today, though the benevolence of his heir, John Pontois, and the subsequent dispersal by Pontois’ heirs, allowed many important volumes to pass into several of the great antiquarian collections of the early Stuart period, including those of the jurist John Selden, the Corpus Christi College, Oxford lecturer in Greek Brian Twyne, and the legendary early manuscripts collector Sir Robert Cotton.